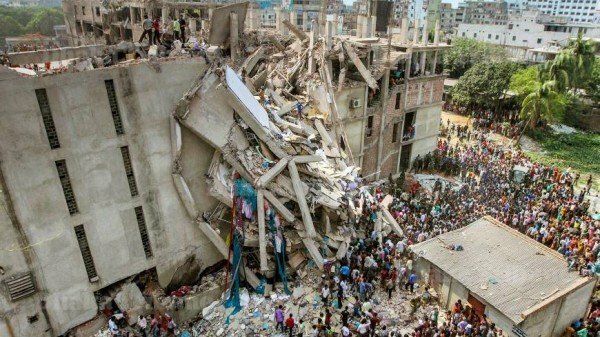 The owner of the Rana Plaza complex has been charged with murder over the Bangladeshi building’s collapse in 2013, killing more than 1,100 people. Sohel Rana and more than a dozen government officials are among 42 people to face charges in Bangladesh. They are accused of ignoring warnings not to allow workers into the building the day before it collapsed. It was the worst industrial disaster in Bangladesh’s history – and prompted criticism of global retail practices. The 41 people accused of murder, who include owners of factories housed in the complex and government officials, initially faced charges of culpable homicide. Prosecutors say that the seriousness of the accident meant that the charges have been upgraded to murder. If convicted, defendants face the death penalty. Eighteen people, including 17 of those charged with murder, have been charged with building code violation. Sohel Rana should now appoint a lawyer ahead of the trial process, the prosecution says. A court hearing is due to take place on June 28 to decide further proceedings. He was arrested days after the disaster as he attempted to flee to India. The building code violation charges allege that three extra stories were added to the factory. The factory, in Savar, some 20 miles outside Dhaka, collapsed suddenly on April 24, 2013. More than 2,500 people were rescued alive, some suffering from terrible injuries. The disaster drew attention to the poor working conditions in Bangladesh’s garment industry, one of the world’s largest. Bangladeshi factories provide cheap clothing for major Western retailers, which benefit from the country’s widespread low-cost labor. Christoph Mueller: "Malaysia Airlines Is Technically Bankrupt"